The Old West, also known as the Wild West or the American Frontier, was a period from the early 19th century to the early 20th century, when the western part of North America was colonized. The adventures of Western cowboys, settlers, outlaws, indigenous Americans and other luck-seekers have been romanticized by countless books and motion pictures. Many Western sceneries and ways of life remain to be seen today. As the first English settlers landed in New England in the 17th century, they developed the concept of the Western frontier, an untamed land of opportunity and Indians. After independence, the territory of the United States expanded westwards. The 1803 purchase of the Louisiana territory (charted by the Lewis and Clark expedition, along the Lewis and Clark Trail) and the annexations past the 1840s Mexican-American War helped fulfill the Manifest Destiny, the idea that the USA should expand all the way to the Pacific coast. While Christian missionaries had settled in the West since colonial times, and small parties of "mountain men" came from the 1810s, larger settler expeditions came with the Oregon Trail from the 1830s, and with the 1849 gold rush in California. Completion of the Transcontinental Railroad. At first "The West" consisted of areas west of the Appalachians that eventually became states like Kentucky, Tennessee and Ohio. Until the mid-19th century, very few settlers ventured west of the Mississippi River, partly because Southern politicians opposed settlement policies. While many settlers went west via wagon train (and more often than not parts of their party died en route) people with more money and/or less cargo usually opted for a ship down to either Nicaragua (see Ruta del Tránsito) or Panama and a short overland trip in one of these countries before heading North on the Pacific side. Illustrious figures of the 19th century traveled these routes, among them Mark Twain (Nicaragua) and Ulysses S. Grant (Panama), who both wrote about their respective trips. The Golden Age of the West is usually held to have lasted from the American Civil War up to the expansion of statehood around 1890. As the Civil War began in 1861, the northern states came to control the Congress, which could pass resolutions to colonize the western territories. The southern resistance against "internal improvements" as well as wrangling over the exact route (and the potential benefits associated with it) were the main things keeping the US from building a transcontinental railroad. When the Southern Democrats left Congress, the radical and progressive Republicans took the opportunity to authorize building of a transcontinental railroad, which was completed by a "golden spike", at Promontory Summit near Corinne, Utah, in May of 1869, less than four years after the war ended. The West provided the country with raw materials for the industrialization of the United States, and extensive farming and ranching which made American fast food possible. While most early settlers were young men, the women of the West could often find better opportunities than in the east and south, as some of them could marry well, or get recognition for intellectual work such as teaching. At least since 1900, rodeos featured both cowboys and cowgirls, and the western territories and states allowed women to vote decades before the 19th amendment of the Constitution ensured female suffrage across the United States in 1919 - approved in Congress with the vote of Jeannette Rankin of Montana. Today, the Western equestrian tradition is increasingly carried on by women. Colonization hit North American wildlife hard; hunters killed tens of millions of wild buffalo that were sacred to many Indian tribes and served as sources of meat, skins and other products; taking their number down to a few hundred. Carnivores such as cougars and wolves were exterminated from many parts of the countries. From the 1880s, the government set up national parks and natural reserves around the West. The environmentalist movement gained strength in the 1960s (with the Environmental Protection Agency and Earth Day established in 1970), and has helped many animal and plant species to recover. The buffalo in particular also owes its survival to the initiative of private citizens in addition to government efforts. The land held by the United States which was not yet part of any State, was organized as territories. A territory or part of a territory with enough population and infrastructure (usually in the form of railroads, telegraph lines and livestock fences) could gain statehood; implying that the land was no longer part of the Wild West. New Mexico and Arizona gained statehood in 1912 as the last contiguous territories, marking the end of the Old West era. In the following decades, the Rocky Mountains were abridged by paved roads such as the Lincoln Highway and Route 66. Alaska is nicknamed The Last Frontier; the territory was purchased from Russia in 1867 and became a state only in 1959. With much of the state remaining as untouched wilderness, America's westernmost state still keeps the Western spirit alive. Others might say that the American space program is the new frontier. Curiously enough, the (very dubious) legal basis of "lunar real estate" which is sold as a novelty item rests on the "Homestead Act" which the US enacted to encourage settlement of the Old West. As a Spanish colony, Mexico was the first part of mainland North America to be settled by Europeans. Spanish Mexico included Texas, California and much of today's southwestern United States. With the exception of coastal California, few Hispanics settled in these territories. The 1810s Napoleonic Wars set off an independence movement in Spanish colonies, in 1821 creating an independent Mexican state. For the first half of the 19th century, Mexico had been dominated by the Catholic Church and strongmen called caudillos. As the Mexican government had little authority in Texas, many slave owning English-speakers settled there in blatant violation of Mexican laws, and the 1836 Texas Revolution led to an independent Republic of Texas. The United States annexation of Texas in 1845 sparked the 1846-48 Mexican-American War, after which the United States established claims on Texas, and annexed the southwestern territories. In the end, Mexico lost nearly half of its land area. Settlers arrived from Europe and the eastern US, acquiring their own farmstead, usually at the expense of the Hispanic and indigenous population. As the policy towards the Indians had become slightly more humane, and the southwestern lands were of less use for farming, the Southwest has the highest proportion of Indian reservations in the United States. Mexico south of the Rio Grande was not as much of a frontier, as most arable land was already owned by a few descendants of the Spanish conquistadors, and few immigrants had reason to settle there. From the 1850s, Mexico saw the rise of modern institutions, with religious freedom, public education and health initiatives; especially during the rule of President Porfirio Díaz, from 1876 to 1911, in a period known as the Porfiriato. Most of the population remained poor, and the desire for land and wealth redistribution was a background to the 1910 Revolution, against yet another attempt by Díaz to get reelected. The Revolution, which went on for ten years, became entangled with World War I, and formed the background to some Western movies. From the 17th century, the Canadian Prairies were dominated by the Métis people, who are of mixed European and First Nations descent. While settlers in the United States and eastern Canada could follow the rivers, travel through western Canada was difficult. Also, the soil was heavy and required machinery to be farmed. British Columbia could not be reached overland until the construction of a railroad. The Fraser Canyon Gold Rush of 1857 was the first major wave of settlement. The Colony of British Columbia was founded the following year. The Dominion Lands Act was made in 1872 to encourage settlement, and the North-West Mounted Police was formed in 1873. The Canadian government was concerned that too many settlers from the United States would claim land, and lead a secession from Canada. Unrest in the West culminated with the 1885 Northwest Rebellion. The same year, the Canadian Pacific Railway was completed, and settlement of the Prairies began in earnest. White settlers were even fewer in northern Canada; most of them being trappers, traders, and naturalists. The Klondike Gold Rush, which began in 1896, was the first major immigration wave, with around 100,000 people attempting to reach the Yukon territory; around the same number as northern Canada's total population today. 30,000 of these settled in Dawson City. The First Nations and Métis remain as a significant part of the population of western and northern Canada. A big part of the process of "taming" the West involved invading Indian territory, massacring Indians and corralling the remainder into reservations. However, many Indians were not murdered or killed in wars, so the West to this day is the area of the United States with the largest Native American population. Many Native Americans (a term used interchangeably with "American Indians"), like the cowboys, are ranchers, and there are quite a few reservations that can be visited today, especially in Western and Rocky Mountain states. See also Trail of Tears. While most settlers were of European descent, Germans were the largest ethnic group; however, much of their heritage faded away due to the anti-German sentiment of the World Wars. Many African-American freedmen moved West to escape racism in the South. There was also a small population of Latinos present in those territories that were previously part of Mexico, as well as a number of Native American tribes, of which the Navajo are today the most numerous. East Asian immigrants, most of them Chinese, took part in construction and mining; often under harsh conditions. Although Chinese laborers played a significant role in building the transcontinental railroad, the influx of them caused a lot of resentment among the white majority. This resulted in the Chinese Exclusion Act being passed in 1882, which prohibited all ethnic Chinese from entering the U.S., and forbade those already present in the U.S. from ever obtaining U.S. citizenship. The restrictions on Chinese immigration would only be relaxed in 1943, and would only be completely abolished with the advent of the Civil Rights Movement in 1965. 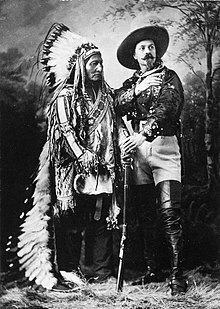 Buffalo Bill and Sitting Bull. The late 19th century is the setting of most Western fiction, a genre as old as the West itself. Western fiction has shaped the national identity of the United States, with the cowboy as an iconic hero character. While many Westerners were indeed cowboys, their lives was hardly as glamorous as in the novels or movies. Dime novels from the 1860s and later often took place in the West, rodeos and roadshows such as Buffalo Bill's Wild West romanticized the Western lifestyle while it still existed in real life, and The Great Train Robbery, considered the first Western film (and arguably the first film ever with a plot) was recorded in 1903. As the West had been tamed in the early 20th century and Hollywood came to dominate the motion picture industry, Western fiction expressed nostalgia for the older generations. Western feature films became an established genre with Stagecoach in 1939, which was the breakthrough of John Wayne, one of the genre's most iconic actors. Up to the 1950s, most major characters in these films were white English-speaking men, though the actual Old West had more ethnic diversity. "Revisionist Western" fiction from the 1960s and later years gives more recognition to non-white Westerners, as well as the often-forgotten women who struggled at the male-dominated frontier. Since the United States has had immigration from most of the world's nations, with a peak in the late 19th century, few historical settings are more relatable around the world than the Old West. While myth making about the West is as old as the old west itself, many countries outside the US have even more far fetched myths of the old west going back to popular authors such as Karl May who is still a household name in Germany despite writing most of his work before ever setting foot in the US. Euro-Western films, wholly or partially recorded in Europe, have been successful, especially the Italian "Spaghetti Westerns" with classics such as The Good, the Bad, and the Ugly and Once Upon a Time in the West. The "Kraut Western" started with movies based on Karl May's work (shot - fittingly - in what is now Croatia, mostly in Plitvice Lakes National Park) made by West Germany and later the "DEFA Indianerfilm" made by East Germany with a much more positive portrayal of Native Americans than otherwise common in Westerns. Vilhelm Moberg's Emigrants series, written in the 1949 to 1959 about Swedish settlers in 19th century Minnesota, is a cornerstone in Swedish literary canon. The Belgian cartoon Lucky Luke, which both celebrates and lampoons Western tropes, has been published since 1949, and is one of the best-selling European cartoons ever. While the Western genre has been marginal since the 1970s as the last generations who grew up in the Old West had passed away, it survives in the 21st century; either celebrating the western legacy with feature films such as The Hateful Eight, challenging its norms as in Brokeback Mountain, or re-interpretating it such as in the Westworld science-fiction series. Even works set in the contemporary West, such as Breaking Bad, use typical Western tropes. The afterworld's image of the West as a place of adventure and freedom makes it a gratifying setting for video games. Oregon Trail is an educational classic, and some well-known 21st century game titles are Gun and Red Dead Redemption. There are many art museums in the Western and Mountain States that show a large number of Western paintings and sculptures. This is a particular style of Romantic art that developed in the 19th century and tends to emphasize the wide open spaces and long vistas typical of the terrain, along with heroic portrayals of white and sometimes Indian men. In the 20th century, probably the most famous painter associated with the West is Georgia O'Keefe, who spent a lot of time in Taos and Abiquiu, New Mexico and worked in a new modernist style distinct from the Romantic style described above but also showcasing the endless mesas of New Mexico in her landscapes (she was also known for flower paintings, etc.). Ansel Adams is one of the most famous Western photographers. The Denver Art Museum has an entire wing of Western paintings. 46.188889-123.8211111 Astoria, Oregon. Fort Clatsop, at the end of Lewis and Clark's trail and the Oregon Trail. 38.555556-121.4688892 Sacramento, California. Founded during the 1849 gold rush. Old Sacramento is well preserved. 29.4245-98.494663 San Antonio, Texas. This metropolis was once a town where Texan liberty was born, at the Alamo. 45.389444-92.8480564 Lindstrom, Minnesota: Karl Oskar Days (Lindström, MN). Lindstrom is known as "America's Little Sweden", northeast on 35E from Minneapolis. The Karl Oskar Days are a celebration of Swedish writer Vilhelm Moberg's Emigrants series, about Swedish settlers in Minnesota. Monument Valley, well-known from Western films. 41.6205-112.5471 Golden Spike National Historic Site, Promontory Summit (Near Brigham City, Utah), ☎ +1 435 471-2209 ext 29. Daily 9AM- 5PM. A May 10, 1869 last spike joined the Union and Central Pacific railroads here, uniting a nation by rail from coast to coast. Vehicle: $7 (summer), $5 (winter). 31.72247-110.077265 Tombstone, Arizona. A legendary Western town. 44.3667-103.71676 Deadwood, South Dakota. A legendary Western town in the Badlands and Black Hills. 37.75-100.01678 Dodge City, Kansas. Fort Dodge was built in 1865. Known from the Gunsmoke series. 39.310278-119.6494449 Virginia City, Nevada. A mining town, today a National Historic Landmark. 38.74667-105.1783310 Cripple Creek, Colorado. A gold mining town. Has a casino today. 45.570278-107.427511 Little Bighorn National Monument, Montana. Commemorates the Battle of Little Bighorn in 1876, where the US Army suffered a remarkable defeat against Lakota, Dakota, Cheyenne and Arapaho warriors, famously known as Custer's Last Stand. 43.14242-102.364942 Wounded Knee Battlefield (just east of the town of Wounded Knee, northeast of Pine Ridge). The site of the Wounded Knee Massacre in 1890. 46.378889-120.31194412 Toppenish, Washington. A town known for Western-themed wall paintings. 32.692222-114.61527813 Yuma, Arizona. At the border to California and Mexico, Yuma has been a transfer point for settlers, gold-diggers and Civil War soldiers, among others. 34.50361-93.0552814 Hot Springs (Arkansas). A spa resort which had its heyday during the 19th century. 40.75961-111.888215 Salt Lake City, Utah. Settled in 1847 by the Mormons, and an important rest area in the hostile Utah landscape. 39.74019-104.9922217 Denver, Colorado. One of the largest cities of the West, and a center of the service sector. 41.145556-104.8019418 Cheyenne, Wyoming. Founded in 1867 at the Union Pacific Railroad. 44.3874133-114.695911819 Custer Ghost Town, Idaho. A ghost town, founded in 1879 for gold mining, abandoned in 1910. 35.026389-114.3836113 Oatman, Arizona. A gold mining town which had 23,000 inhabitants in the early 1900s; today around 150 people live here. 36.9833-110.120 Monument Valley, Arizona. An iconic scenery, used in countless Western films. 46.408333-112.7394444 Grant-Kohrs Ranch, ☎ +1 406 846-2070 (ext. 250). 50.4197-114.2335 Bar U Ranch, Longview (Alberta), e-mail: BarU.Info@pc.gc.ca. National Historic Site run by Parks Canada. This ranch, situated between the Porcupine Hills and the Rocky Mountains, is preserved as life was during the time period 1882-1950. During this time, the Bar U was one of the foremost ranching operations in Canada. Over 35 buildings and structures, as well as the staff in period costume and character, allow the visitor to experience and understand life on the historical ranch. The ranch opens in mid to end May and closes in mid to end September. 49.7494-113.6256 Head-Smashed-In Buffalo Jump, near Fort Macleod (From the major intersection of Highways 2 and 3, go about 1km north on Highway 2, turn left (west) onto Highway 785 West, follow signs for about 15km), e-mail: info@head-smashed-in.com. This UNESCO World Heritage Site has been in use for 5,500 years as a place where the aboriginal people of the plains killed buffalo by stampeding them over a cliff. An interpretive center built into a cliff has exhibits on the buffalo hunt. 53.065833-121.51722221 Barkerville (BC) (Near Quesnel). An 1861 gold rush town, once with a population as high as 5,000, was abandoned by the turn of the century. 64.066667-139.42916722 Dawson City (Yukon, Canada). The busiest town of the Klondike Gold Rush. Begin in Tombstone on Gleeson Rd, which becomes a graded dirt road. The 31.729892-109.8474117 Gleeson Cemetery will be on your left, a short distance before the townsite. Remains of 31.732502-109.8296058 Gleeson. include a saloon, schoolhouse, hospital, and newly restored jail. Head north to 31.769478-109.8099239 Courtland on N Gleeson-Pearce Rd, aka Ghost Town Trail, which has just a couple of ruined structures remaining. Go further on to 31.905214-109.82118510 Pearce with two structures on the National Register of Historic Places: the Old Pearce General Store and Our Lady of Victory Catholic Church. From here continue on Hwy 191 to see Cochise and the historic 32.114494-109.92257211 Cochise Hotel. Route 66 (1926-1985) follows earlier routes (such as the National Old Trails Road from New Mexico westward) which follow the trails which opened the West for travellers. This travel topic about Old West is a usable article. It touches on all the major areas of the topic. An adventurous person could use this article, but please feel free to improve it by editing the page.